So far, the team fielding more Korean players is undefeated in OWL. Through the first week in the Overwatch League, the team that fielded more Korean players won every single series. 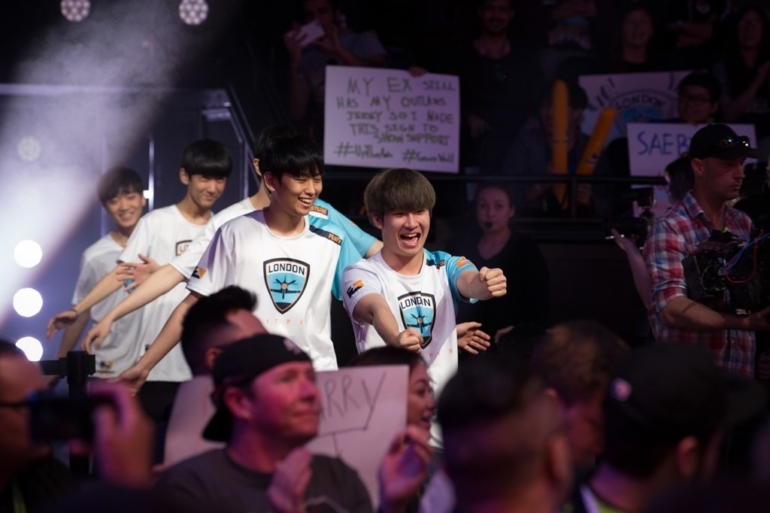 That was no more apparent than day four of the OWL, when the London Spitfire, New York Excelsior, and Seoul Dynasty—the three franchises featuring rosters of solely Korean players—ran the table. London Spitfire opened the slaughter by taking out Philadelphia Fusion 4-0. Things looked iffy to start on Junkertown when Spitfire barely finished the map on attack thanks to superb Widowmaker play from Fusion’s Lee “Carpe” Jae-hyeok, but they took control after that. From there, Spitfire’s star-studded lineup made Fusion look silly on Horizon, Ilios, and Numbani. New York Excelsior had a more difficult time against Houston Outlaws in a 3-1 win, losing the opening map of Junkertown thanks to a well-executed offense and scrappy defense by the Outlaws. After a close game on Anubis, though, Excelsior subbed in their McCree specialist, Kim “Pine” Do-hyeon, who absolutely dominated the round. Numbani was an afterthought with the New York side easily blasting a demoralized team. Then came Seoul Dynasty—the favorites to take the OWL title—who put together their own 4-0 sweep. The Los Angeles Gladiators put up a fight on Junkertown, but after heading into a must-win overtime push, the early pick for league MVP—Kim “Fleta” Byung-sun—shut the door with some incredible Widow picks. On Horizon, the Dynasty posted a ridiculous attack, giving them a six-minute plus time bank, and things didn’t get easier from there for the Gladiators. After today’s three series, the team fielding more Korean players is undefeated with an 11-0 record. Their map score is even more impressive at 37-6-2. Those numbers include series like the Los Angeles Valiant against the Dallas Fuel, where the Valiant roasted Fuel while fielding three players of Korean nationality to Fuel’s one. Only one of the 12 initial Overwatch League franchises may be based in Korea, but Korean players are so far dominating the league. In many ways that’s no surprise—Korean esports infrastructure has dominated the globe in titles like League of Legends for years. And while Western teams may have had a slight edge at Overwatch’s release, Korea’s dominance has since become the norm in Overwatch. The game is incredibly popular in Korea, and competitive Overwatch in particular—for example, the Korean side of the Overwatch Open features more teams registered than the rest of the world combined. There are more players playing Overwatch seriously in Korea than anywhere else in the world, so it’s only natural they’re well-represented and even dominating the league. For Western fans hoping the OWL helps create the infrastructure and playerbase needed to produce star Western players who might change that, it looks like you may need to wait a few years. Korean esports dominance has a long history, and it’s come to Overwatch League.